The first 24 players paid in full will be accepted. All players must be paid in full on or before week 2. (NO WALK INS) Please do not invite someone to take another players place. There is No trophy, NO medals, No cash prize, No playoffs, Therefore there is No whining. Offside from the yellow line. Bring a RED - WHITE and BLUE shirt, be prepared to switch teams. 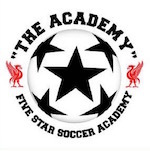 Check out this Soccer (Indoor) league 'Wednesday Night Winter 2019' with Five Star Soccer Academy!